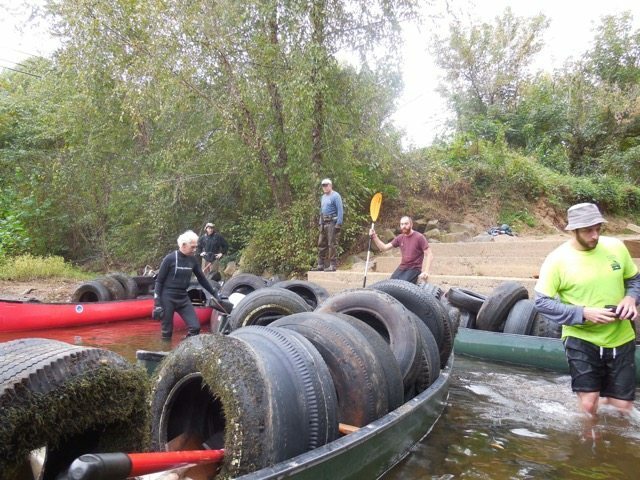 Volunteers with the Rivanna Conservation Society removed a total of 152 tires from a 6.5 mile stretch of the Rivanna. It required 3 trips with heavily laden canoes but the bulk of the tires were removed and the job of keeping the river clean of tires should be manageable now that the bulk of tires are gone and responsibly recycled. I was curious what technique you used to haul the tires out of the river and into the canoes. Was it just sweat and muscle which is probably the answer? I am looking at possibly trying to organize something like this for our Boy Scout Troop and it would be nice if there was a bit of a more mechanical way to do this since they aren’t as big as grown men and last thing I want to do is get someone hurt. Also do you know when you may do another cleanup day when it gets warmer? I am a few hours away but would be fun to come out and help and learn how you guys do it to pick up some tips for doing it on the Potomac. Thanks.